In South Africa, we have stumbled upon a new trend: that of disrupting the business of legislatures, be it the national Parliament or provincial legislatures. It seems, though, that little was gained either in Gauteng or the Western Cape due to the rather amateurish disruptions of both state of the province addresses recently. In the Western Cape legislature, the speaker was compelled to suspend the proceedings and Helen Zille promptly delivered her state of the province address before the media. 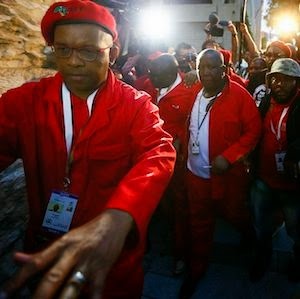 In Gauteng, Premier David Makhura was also interrupted several times by unruly Economic Freedom Fighters (EFF) members. In the Western Cape there appears to have been a backlash from some African National Congress (ANC) supporters piqued by their party’s disruptive conduct. Of course a few weeks ago, the ANC similarly disrupted a city council meeting regarding the demolition of houses to make way for a MyCiti route.The ANC in the Western Cape under the hapless leadership of Marius Fransman seems to have neither a strategic plan nor the political nous to deal with the specific challenges of the province. Who is it speaking to, and whose vote does it wish to garner? They seem to keep missing the point by playing grand-standing politics. Quite how disrupting Zille’s speech might further an agenda with the poor and working class is, frankly, baffling. Similarly, EFF members in Gauteng have tried hard to replicate the behaviour of their national counterparts and failed dismally. In both instances, though, the speakers of the provincial legislatures, unlike the speaker of the National Assembly, Baleka Mbete, did not take the bait and dealt with matters even-handedly. No police were called and no violence ensued – but the disruptions told us a great deal about the state we are in. Political parties seem to be locked into endless, vitriolic debates with little substance. Tinkering around the edges of the great challenges of the day – poverty, unemployment and inequality – they fight for the spoils of weakly constructed arguments. As Barney Mthombothi wrote so eloquently recently, we seem to be a country obsessed with ‘trivia and mediocrity’. How right he is. It is time to inject a dose of realism into our politics, along with the ability to deal with the sticking points in our society with foresight and wisdom. Quite separately, President Jacob Zuma took the heat out of the National Assembly during his reply to the state of the nation address reply on 19 February. He was even declared ‘presidential’ by some in the media. Sometimes we have short memories. Yet, the wily politician that Zuma is, he managed to defuse the tensions in Parliament for the time being. And while all this was swirling around the president’s head, extraordinary allegations arose last weekend that Zuma was poisoned by one of his wives, Nompumelelo Ntuli. Lady Macbeth, step aside. We have no idea as to the truth of these allegations, but if they are accurate, there certainly are grave dangers to the state. One wonders whether the State Security Agency (SSA), so busy fighting proxy party political battles, has any idea of real security threats to the president or anyone else actually. The Al Jazeera ‘spy cable leaks’ show just how compromised the SSA is, and how it has lost all focus. Quite how the SSA will go about regaining its credibility remains to be seen. But this is the uglier side of a state-led society of secrets. The signal jamming at the state of the nation address was but one manifestation of an SSA that is unaccountable and partisan. In all public institutions, we seem to need less heat and more light to give content to our right to receive and impart information – thus creating a government based on transparency and accountability, as envisaged by the constitution.